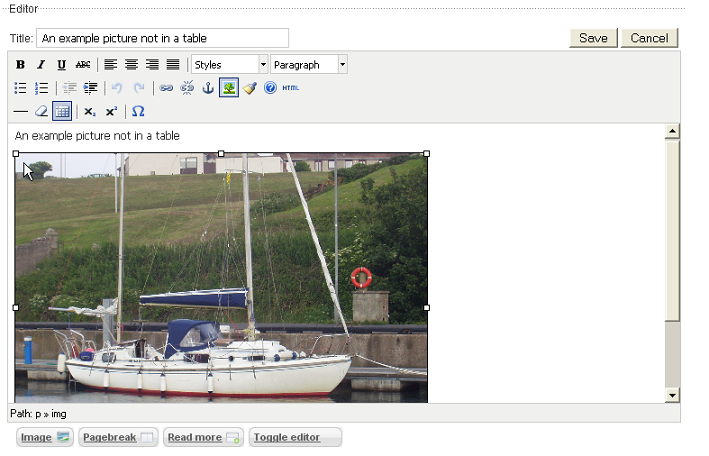 The aim of this document is to show how pictures (also called images) can be added to Articles. It is one of four documents with hands-on instructions about editing Articles in a series introducing Joomla! version 1.5. Many articles benefit from having images, illustrations or pictures in them. But there is more complexity in inserting images than in entering and manipulating text. It is worth a try - even if you do not have a lot of experience. The main problems are likely to be manipulating the image itself, especially if you are mainly used to altering text. For the mechanics of uploading the image - do look carefully at the uploadscreen and be aware of where the various files are, especially if you do not have a lot of practice with locating files. There is more complexity in inserting a picture than in writing the text. Insert it into an article. 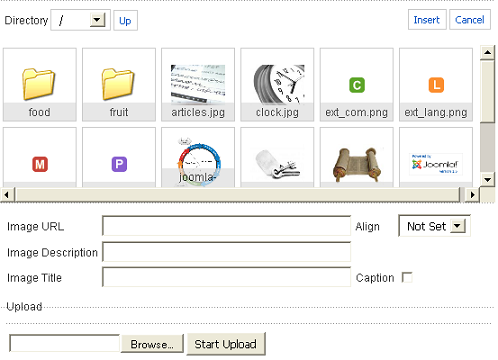 You have to prepare the image but the mechanics of upload and insert are done using the editor. The detail depends upon the Web site that you are using. Your picture is likely to be on your own computer, where you can edit it and give it a suitable name. The picture has to be on the web server (where the web site is hosted) in order to be inserted in an article. There will be a place for you to put the picture files on the web site you are using and you need to know where this is located in order to insert an image. 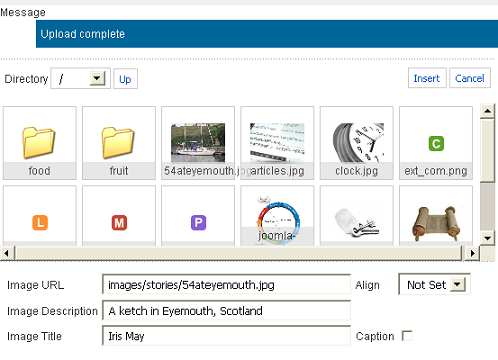 You will not be able to copy the image file directly to that place, the article editor does this as part of the insert process. 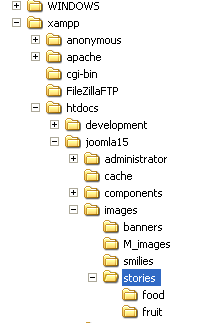 If you are using the localhost sample data, there is a folder for images. You can copy the image there but it is useful experience to upload it using the editor. You may find it easier to get the picture where you want it to be on the page by setting up a table with one row and two columns. The text is entered in one cell and the picture in the other cell. Create a table with one row and two columns - and no border. Put the picture in one cell and any commentary in the other. This is frowned upon by purists but it is a convenient way to get a helpful layout. Position the cursor where you want the image to start vertically on the page. If you are using a cell in a table, then place the cursor in the cell. The dialogue box opens and hovers over the edit screen. The top part of the screen defines where the pictures will go on the server. The bottom part is where you can browse for the picture on your own computer. The update image dialogue box showing where the pictures will go and allowing choice of a file from a local computer. 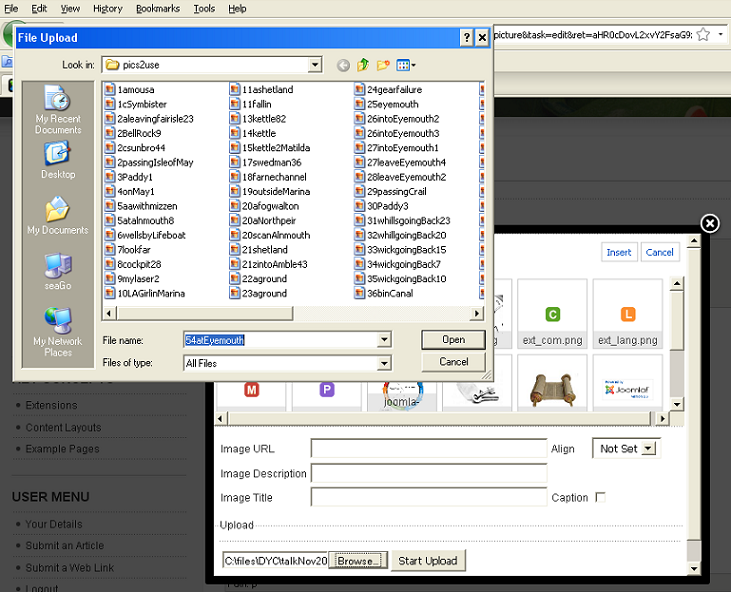 This opens the File upload window which lets you find the folder where your image is located. This puts the location into the Upload box. After upload, the file should show up be amongst the image files at the top section of the screen. Image Description: Give the image a description (needed for those who are visually impaired and have the information converted to speech). Align: This can be set to the left or right of the text. Image Title: Give it a title, which displays when the mouse cursor hovers over it. The picture should be inserted on the page according to your instructions. It may look a little strange in the editor. The image inserted in an Article. The layout does not use a table in this case. A common problem is that the picture is the wrong size and sometimes much too large. resize it on the screen - the most straightforward but there is a bit of a knack in doing it! drag it to make the image smaller or larger. You can repeat re-sizing again but may need to Save and then Edit again. Use Alter Dimensions: But be careful because you need to keep the relationship between the height and width of the image. With a very large picture it can be useful to put in a decimal place. resize the original picture using an editor and upload it again. Then delete it from the article, re-import and insert it again. It is often necessary to fiddle around to get it the right size and in the right place. The picture remains on the server. This page was last modified on 6 June 2013, at 07:20.